To this day, I have a hard time calling myself an athlete. To me Ryan Hall (marathon runner), Craig Alexander (Triathlete) and Cadel Evans (cyclist) are real athletes. But after having completed a Half Ironman, Nik tells me I am an athlete. She also said my story might motivate others, which is why I’m telling it now. After having gastric bypass surgery , I decided I wanted to take fitness seriously. Like many post-ops I had a goal of completing a 5K which I did 11 weeks after surgery and I committed to do more of them. But after my 9 year-old son beat me in my second 5K I was ashamed of my fitness level and decided it was time to really get serious. 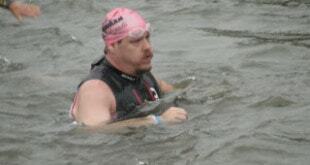 In April 2011, I had to pull out of my first sprint triathlon because of a shoulder injury. It was then that I decided to sign up for an even bigger race: the Augusta Half Ironman event on DATE in Georgia. For those of you who don’t know what a Half Ironman is, it consists of three events: swimming for 1.2 miles, biking for 56 miles and finally running a half-marathon (13.1 miles). 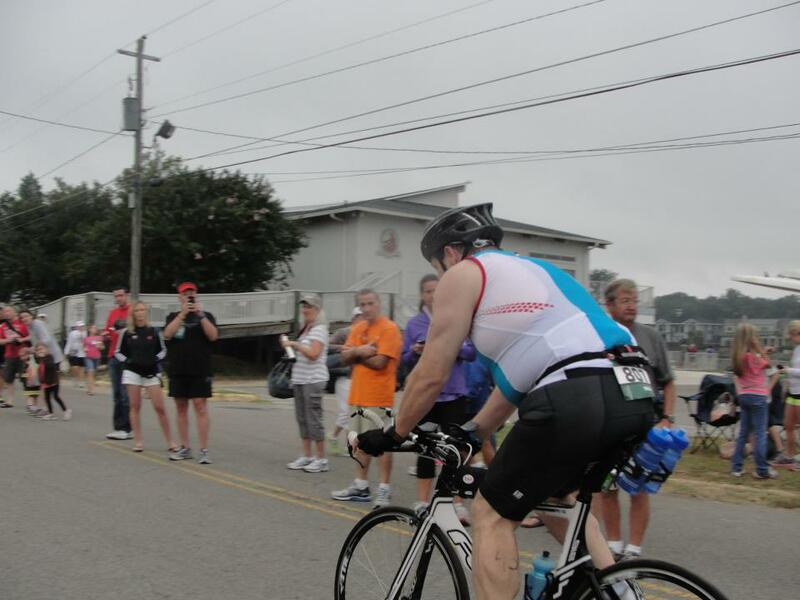 In total, a Half Ironman has you pushing through 70.3 miles — further than I’d ever gone before. Needless to say, my hands were shaking as I hit the registration submission button to enter myself for this event. I trained for over a year for this event. Along the way, several life events sidetracked me from training. But as the date of the event drew near, I was committed as ever to do it, trusting that my training would carry me physically while the support of family and friends would carry me mentally. We drove to Augusta on Friday afternoon (a day ahead of the event) so we could spend the day relaxing and I could get my race packet early before the lines got long, I figured I was nervous enough and didn’t need to be standing in line for endless hours. Saturday morning I headed to the host hotel which was just a couple blocks away. I was the 20th person in line and got my packet relatively easily. My wife and kids were there and we decided to check the expo out together and I got a free massage that they were offering all the athletes. That night, I met up with a friend I met on Obesity Help, a fellow athlete named Jillian. On Saturday evening I went over everything and got my water bottles ready for the morning. I had a slight freak-out moment when I couldn’t find the straws for my Aero Bottle. It’s a handy thing on long rides, since it holds 50 oz. of fluids an inch away from my face, so I can drink easily. As you might guess, hydration is extremely important in endurance sports. In the end, I decided that since I could carry three bottles on my bike, I’d be ok so long as I take on new bottles at each of the three aid stations. I tried to calm myself and headed to bed. I woke up at 2:30 a.m. excited and tried to go back to sleep but an hour later I gave that up in favor of performing my pre- race rituals. Which involves cleaning, triple checking my gear and finally putting on my race outfit, which requires includes anti-chaffing lotions at this distance. After that, I headed out to the shuttle that goes to the start of the race. And I remained calm…until a short way into the race I swam into a group of guys and got kicked and bumped. After it happened again, my confidence began to sink. 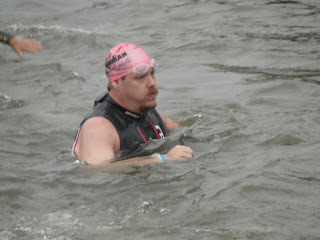 But still, I pushed ahead, mostly breast-stroking, and completed the swim in 44 minutes, 2 seconds. As I transitioned to the bike I could hear my friends and family continue to cheer me on and it gave me strength. I was also pretty confident in this part of the race as biking has typically been my strongest element of triathlons. But you and I both know the universe wasn’t going to let me off easy. At about mile five, I grabbed my water bottle off my seat to take a drink. As I put it back it fell and I had to stop to get it. Then two more of my bottles went into a storm drain. So I was left with about 40 oz. of water to get me to the first aid station. “Ok, no problem,” I thought to myself. Then at mile 15 I hear something drop and slide across the ground — my $200 pair of Oakley glasses! Needless to say I went back for them. Calamity aside, I made it to the aid station and got myself another bottle of water. I also took in an energy gel pack to refuel. At this point, I’m felt good and ready to continue on. But did I mention that the universe was not going to let me off that easy? Around mile 30 things start to go wrong. I’d been so focused on making progress that I was behind on my hydration. Through a series of unfortunate events I lost yet another set of water bottles in the next leg of the ride. This is not good. I completed the bike ride in 3 hours, 19 minutes but as I prepared for the 13.1 mile run I knew I was dehydrated and that it would cause problems. As I head into the final leg of the event, I knew I’d have to fight for the finish. I decided to interval, running one block then walking the next. I also decided on a plan to drink no less than two cups of water at each aid station and I’d go between using gel packs to refuel and salt pills to control my sweating. Mile by mile, I was determined to finish this race. I saw my family and friends again at the start of the run but didn’t seen them again until mile 5. Man what a relief that was! I found that other athletes were working the same plan as me — running and walking — and I got a chance to get to know some of them. At this point, my time wasn’t nearly as important as finishing! About three miles from the end it begins to rain and I thought, “Damn, I could use some cool down right now.” Be careful what you wish for. I ended up running my last two miles in what seemed like a monsoon! But finally I saw the finish line and that re-energized me. I can’t describe to you how it felt to cross that finish line. I’d completed the run in 3 hours, 9 minutes but that wasn’t the point. I FINISHED!!! And yes, there was a LOT of pain. In fact, that night was one of the most painful in my entire life. At one point I couldn’t even lift my legs onto the bed. Looking back, I can say with confidence the whole thing — the training, pushing through life’s challenges, all the calamities of the race — was worth it. I learned a lot about myself preparing for and going through this race. My race times weren’t the greatest ever, but that wasn’t the important part. I set a big goal, a huge goal, a goal even I had a hard time believing I could achieve — and I did it! This is the part about my weight loss that continues to amaze me every single day.And to answer the question I know is in everyone’s minds: YES! I am absolutely going to do it again next year! Paul Corley had gastric bypass in 2010 and is working to achieve ultimate fitness! Want to ask Paul a running, biking or swimming question? You can send them to [email protected]. If you’d simply like to congratulate him on his accomplishment, feel free to leave a comment!